"The E-Lai of ancient times 古之恶来 (gǔ zhī è lái)"
("E Lai 恶来" was a stout hero in ancient times who was so strong he could tear up a tiger with his bare hands. E Lai served King Zhou 纣王 in the Shang Dynasty 商朝. The Shang Dynasty dates back more than 1000 years before the Three Kingdoms era around the period BC 1600 - 1000). The incredible Hulk of ancient China. 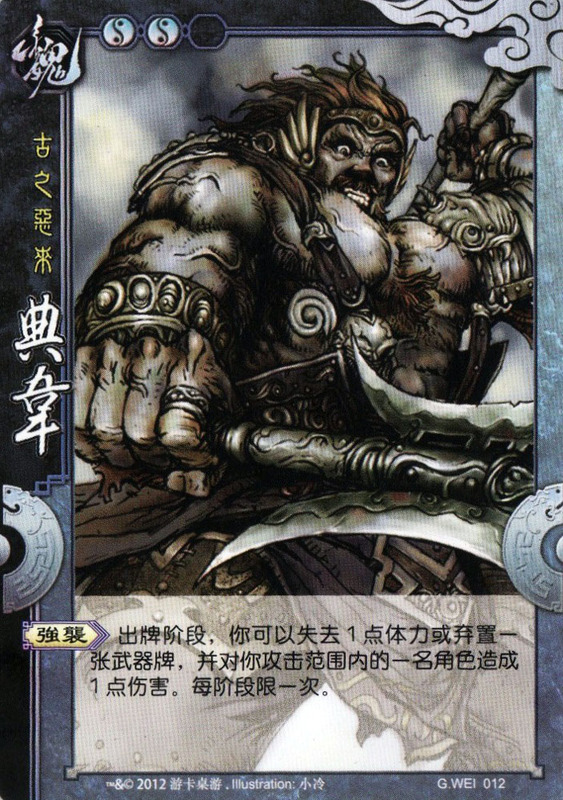 Dian Wei was reputed to have superhuman strength and was Cao Cao 曹操's trusted bodyguard. Sadly, though, most people who know the story would remember Dian Wei for his premature death. While alive, he was extremely loyal to Cao Cao and was always seen by Cao Cao's side. He uses a unique pair of Halberds that weighs 20kg each (yeah right!!!) that is never again mentioned in the story after his death. Even in death, Dian Wei still got airtime in the story because every time Cao Cao passed nearby Dian Wei's tomb, he would pay a visit and weep for the loss of his bodyguard. 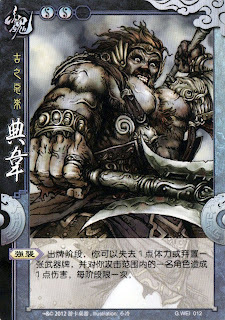 Character ability: "Ferocious Assault 强袭 (qiáng xí)"
During your action phase, you can either lose 1 unit of health or discard a weapon card to inflict 1 unit of damage to another player within your attacking range. Limited to once per phase. This ability, in my opinion, is related to the circumstances that killed Dian Wei. His enemies knew that Dian Wei is feared because of his dual halberds. Just prior to the attack, a defector stole his pair of halberds while Dian Wei was sleeping. When Dian Wei awoke during the chaos, he found his halberds missing but fought on with his bare hands anyway. Dian Wei then grabbed enemy soldiers and swung them about like batons, using the enemy themselves as weapons. However, Dian Wei was still wounded and slowly bled to death, all the while fighting like a mad man and killing many before he took his last breath. Therefore I see a connection between "discarding a weapon card" and his halberds getting stolen. There is also less direct link between "reducing 1 unit of health" and his fight to the death. It is likely that “discard a weapon card” refers to his performance in the previous battle. It was said that Dian Wei could throw halberds with enormous force but short range. Thus, he told his subordinates to remind him once the enemies approached the distance of five steps. As the enemies entered this range, he threw halberds and killed them without any difficulty. In SGS, he could throw his halberds (discard a weapon card) to inflict damage, with the limitation of attack range (his throwing range is short).